I love sweet potatoes! Though up until 6 years ago, I didn’t even care if they existed. 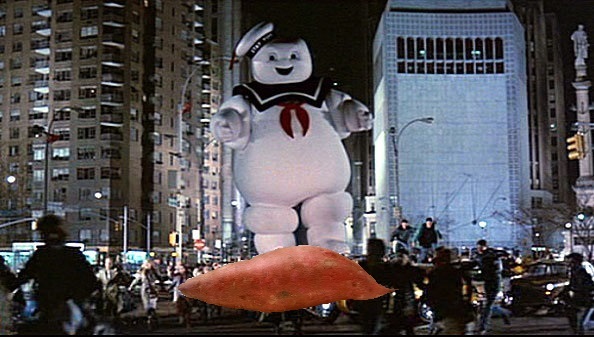 I thought of sweet potatoes only as the Thanksgiving side dish monstrosity that drowns in a marshmallow mash reminiscent of a Ghostbusters’ Stay Puft Marshmallow Man attack. In reality, sweet potatoes are delicious, extremely healthy, and certainly not a one trick pony. 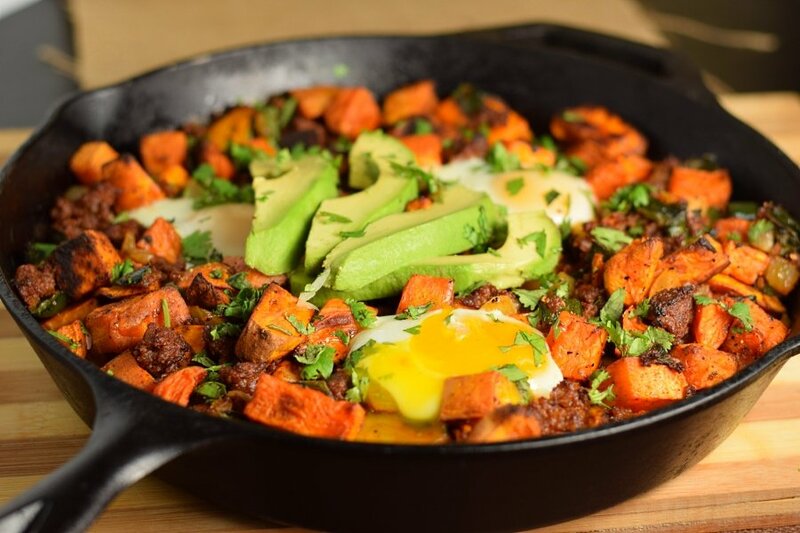 And nothing celebrates a sweet potato’s flavor like a good ol’ fashioned hash with great Mexican flavors like chorizo sausage, poblano peppers and ancho chili powder! 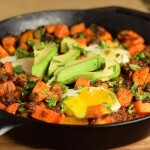 My chorizo and sweet potato hash with eggs has just a touch of heat but is jam packed with flavor. Hashes are great because they don’t dirty many dishes, they are easy to prepare and can accommodate a wide array of modifications. 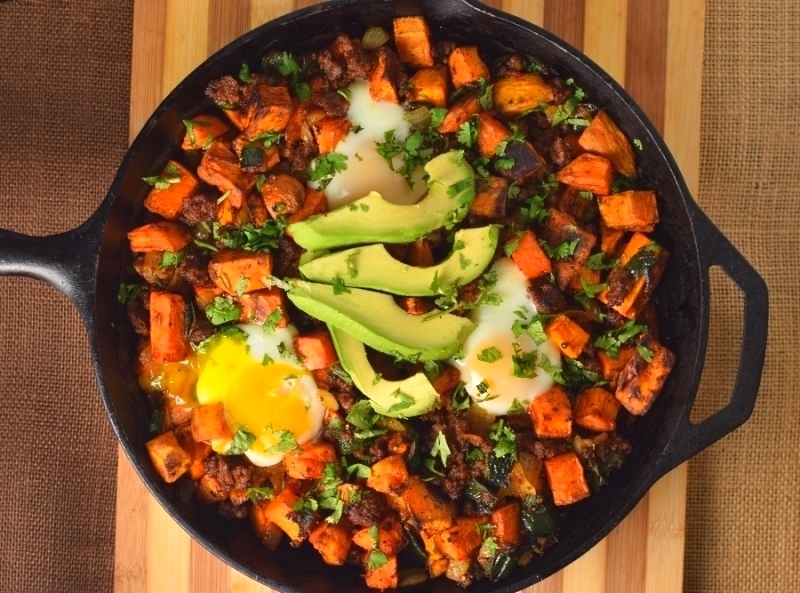 Though my chorizo and sweet potato hash recipe has eggs, similar to a breakfast meal, I love it for lunch and dinners too! It doesn’t really feel out of place eating it at any time of day. Since you are going to the store anyhow to buy the ingredients for this recipe you may want to check out my Cilantro Lime Chicken Tacos recipe as well since it calls for many of the same items. I love being able to double up on my shopping list ingredients. It saves money and less goes to waste! Oh and those chicken tacos are freaking amazing. I like using a good 12″ cast iron skillet for this meal. It is versatile enough to brown the sausage, peppers and onions on the cooktop and easily handle the heat from the oven as well. Lodge cast iron is the only brand of cast iron I would even consider buying brand new. The quality of most other new cast iron cookware is pretty abysmal. Otherwise if you can get your hands on them, old Wagner or Griswold branded pans are extremely high quality, really old, and getting harder to find. Check out my How to Buy Cast Iron Cookware blog post for more of my thoughts on the subject. Peel sweet potatoes and chop into 1" pieces. Place sweet potatoes in a large bowl, add oil and seasonings and toss to coat evenly. Place sweet potatoes on greased baking sheet and bake at 425 degrees for 40 minutes, or until done, flipping halfway through to prevent burning. While sweet potatoes are baking chop up onion and peppers. Place pepper in a skillet and add ground chorizo. Remove chorizo from casing if needed. Cook for a few minutes and then add onion to skillet and continue cooking until the sausage has browned and onions are translucent. Keep warm while potatoes finish cooking. Once sweet potatoes are cooked through add to sausage mixture and combine thoroughly. Add raw eggs to the top of the hash and return to the oven and continue baking for 10 minutes, or until the eggs whites are set but yolk is still running. Remove from oven, add sliced avocado, cilantro, and serve. Adding seasoning is nice, but don't worry if you don't have Ancho chili powder. It won't ruin the dish if it is omitted. Otherwise replace it with Paprika and a dash of cayenne. Eggs are just about done cooking as soon as the whites no longer look clear. You get bonus points if you noticed my images have less eggs than the recipe requires. Yet another reminder why it is good to double check that you have all the needed ingredients before you start cooking! 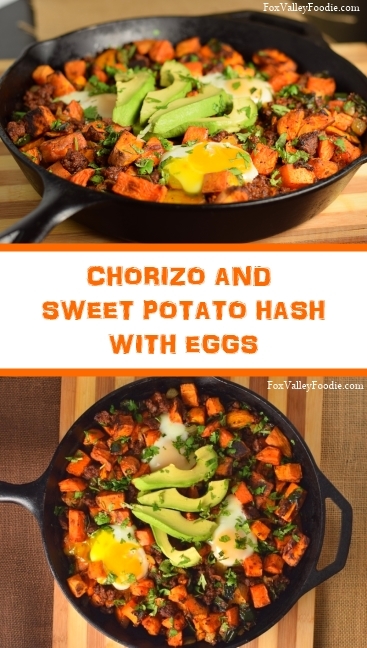 If you enjoyed reading my Chorizo and Sweet Potato Hash with Eggs recipe then you should probably like me on Facebook and follow me on Pinterest too. That’s what I would do at least, because if you don’t get to know me but you still use my recipe it is kind of like taking candy from a stranger, and your mom taught you not to do that. Don’t disobey your mom, subscribe to Fox Valley Foodie today. Thanks so much! It is such an easy recipe, and one I really need to make for my family more often! I LOVE blue cheese—————–any recipes ????? ?